When I was a choir boy, I was part of an ensemble that had a repertoire of about 400 pieces of choral music. Each week we would get the music for the four difference services we would sing (three on Sunday and a fourth the following Wednesday). Our rehearsals at school were focused on refreshing out memories of the music (or learning it if it was the first time), and generally becoming comfortable with all the notes, all the dynamics, and all the words (which might be in modern or olde English, German, Latin, among other languages). But before we performed, we would always do a rehearsal in the church, whose 96 foot tall ceilings created a unique acoustic challenge (and opportunity). 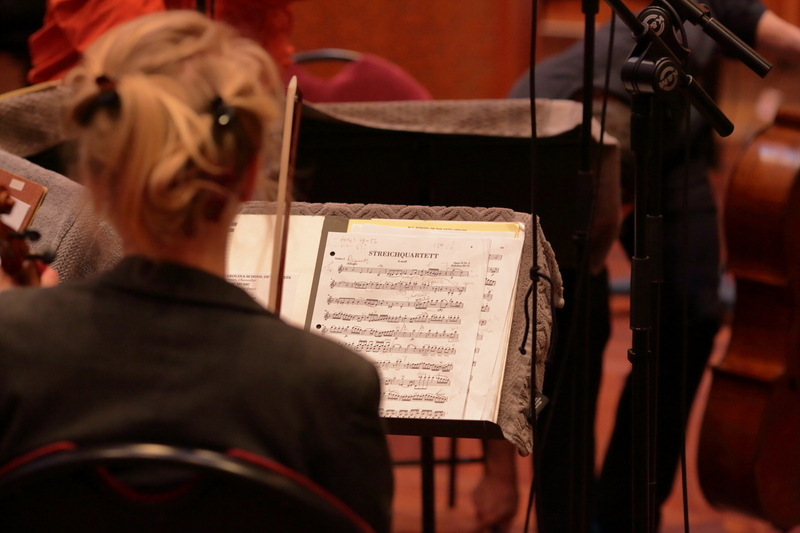 In those rehearsals, we would refine the technical interpretations to make the most of our acoustic environment. 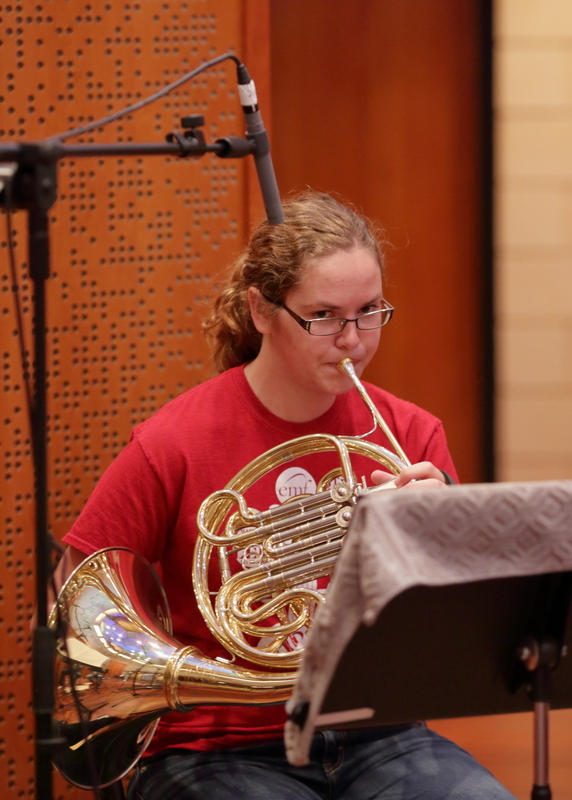 In similar fashion, students at UNCSA have practice rooms where they can focus on achieving technical mastery of their music. And they prepare to perform in all types of environments, ranging from Watson Chamber Music Hall at UNCSA to a middle school gymnasium to an activity room at a nursing home. They learn that in highly reverberant spaces, they need to let the room calm down before filling it back up with too many notes. In less “live” environments, they might have to play louder or with more emphasis to compensate. In general, the musicians respond to the room as the room responds to the musicians and a balance is achieved. BUT! What is the balance, really? The audience can give great compliments, and the players can be happy with the performances, which is all great. But what is really being projected beyond the circle, and how does it agree with what the artists intend? This was one of the questions we hoped to answer by bringing these ensembles into our acoustic environment. Another (very similar) question we wanted to answer was how to adapt their playing in an environment designed for accurate capture rather than a flattering experience. 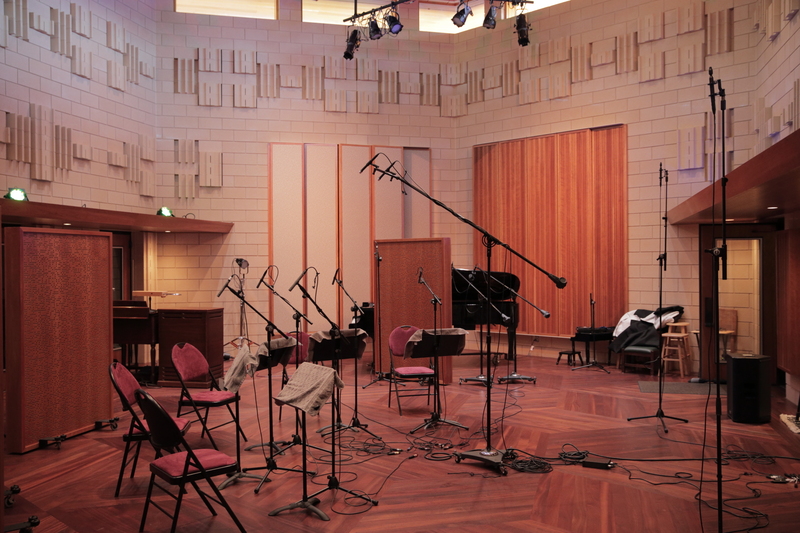 That’s not to say that things don’t sound good in the studio–they do! But the sound of the room does not provide the support, encouragement, and dare we say, concealer that the thick and dense reverb of a traditional performance hall can provide. As they say, we don’t know what we don’t know, and we saw this session not only as an opportunity for the students to get some objective feedback on their acoustic performances, but also an opportunity for us to get some objective feedback on our own. 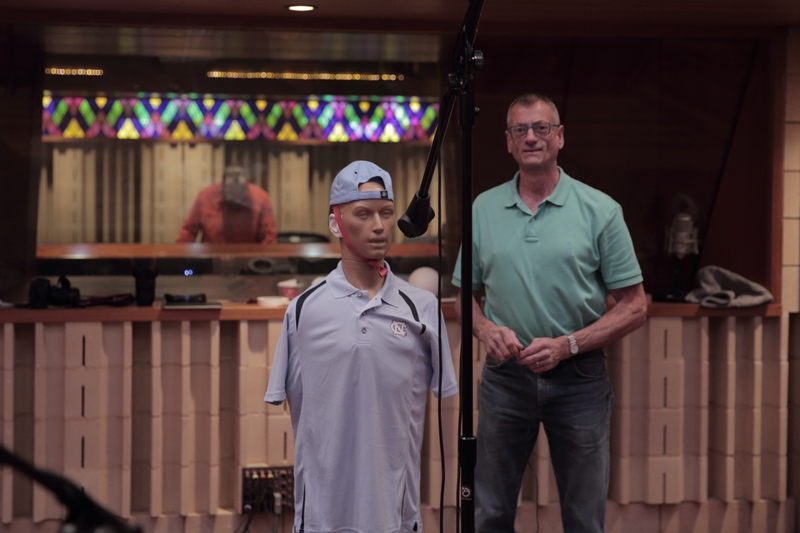 Audio engineer (of the scientific kind) Dan Lilley has a KEMAR binaural recording device, which is designed to accurately capture sound the way we hear it. For example, the ears hear not only the sound traveling directly from the instruments, nor the sound as it reflects off the surfaces of the recording studio. The ears also hear sound as it reflects off, and resonates within, our own bodies. With soft skin, a torso, shoulders, resonant chambers, etc., KEMAR is designed to capture the subtle cues that tell us whether sound is to our left or right, above or below us, in front or behind us. When played through headphones (which miss all these cues), one still has a sense of position and orientation. Or so that theory goes. By inviting Dan to record alongside Ian’s musically-placed microphones (close mics on the instruments, a group microphone (stereo pair) picking up the ensemble, and room mics picking up the room reverb) we now have data we can analyze. We can establish for ourselves how well our various theories and expectations jive with reality. We still believe that when mixing music to be played on speakers (how old-fashioned! ), a careful blending of direct, reflected, and reverberant sound will yield great results for those who listen to music in their living rooms and whose own bodies provide the final nuances to their audio experiences. But now we can objectively compare these two very different techniques, and perhaps discover ways to get the best of both worlds. 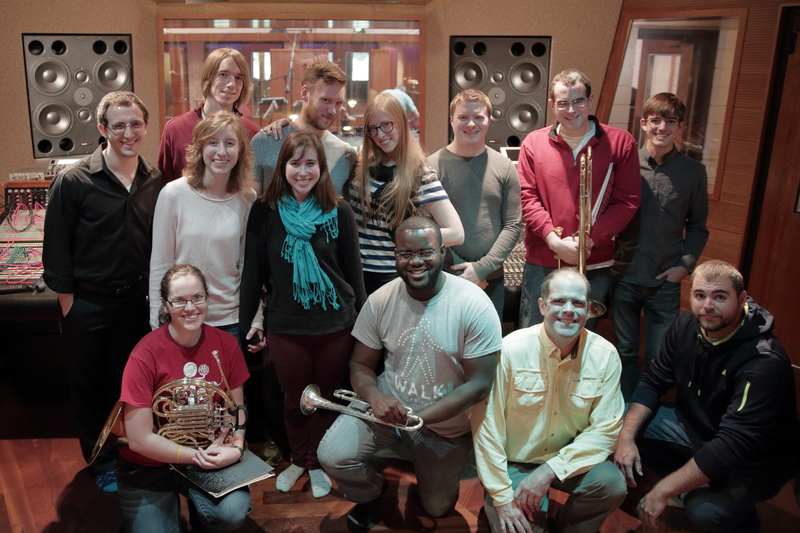 In this way the collaboration between Manifold Recording and UNCSA has helped us both raise our respective games. For each of us, this was an opportunity to bring our best to the table, and then to see how well it works as we illuminate the unknown. Best of all, it was a lot of fun!